Cebu’s smart city chief Paul Nigel Villarete shares how it uses a mix of old and new solutions to tackle a growing city’s problems. The Mayor of Cebu City’s mobile number is emblazoned in bright yellow across the top of his Facebook page. “If you need anything, my personal number is 091 7 329 9999 :)”, it reads. This Philippine Mayor, Tomas Osmeña, has taken on a personal initiative to make citizens feel that their complaints are heard. This leads him to be constantly active on Facebook, frequently posting updates on his executive orders and responding to citizens’ complaints within minutes. Paul Nigel Villarete, the Mayor’s right hand man and Chief Smart City Officer, shares with GovInsider the problems a growing city such as Cebu faces, and how the City Council looks for new ways to tackle them. A large part of building a smart city, Villarete notes, is making sure citizens are heard. “We have to make sure that any advancement we have with smart cities and smart technology, that nobody will be left behind,” Villarete points out. The City Office is currently in talks of building an app where citizens can submit complaints and requests – whether paying for a service, requesting a garbage collection or notifying broken streetlights, he notes. The app will act as a platform where the government office and citizens can interact better. The Mayor, Villarete points out, is highly participative and interactive. Citizens text their complaints to the mobile number displayed prominently on his Facebook page, and it is the main tool of communication between the citizens and the Office. ”Anybody can call him anytime, anybody can send a message to him anytime and all of these things that are being discussed by the mayor,” he highlights. For instance, there were numerous complaints on the page about vehicles driving on the wrong side of the road. In response to this, the Mayor released an executive order which impounds vehicles found driving on the wrong side of the road. “It’s not totally eradicated but it actually lessened a lot of number of counter flowing incidents in the city,” Villarete notes. The city is also engaging the elderly and the youth in new ways. The City Office established a programme in 2016 to deliver free medicines to the homes of registered beneficiaries everyday. The programme covers common illnesses such as high blood pressure, diabetes and heart diseases, and discussion is under way to include others such as asthma. Currently, the Long Life Programme caters to over 40,000 residents, and the number is expected to grow, Villarete says. According to the Mayor’s Facebook page, the programme will reduce strain on hospitals in the city and help the City Office save money in the long term. “This is something that is new, I haven’t heard of any other city in the Philippines [trialling this],” notes Villarete. 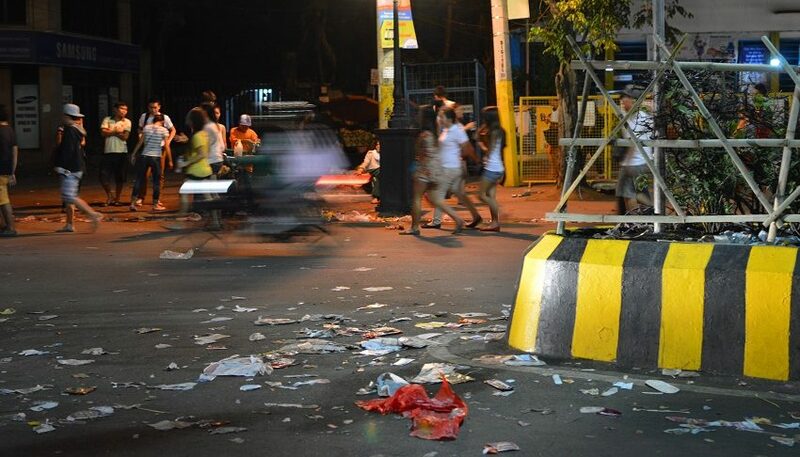 Cebu is a university city with students from across the region who often don’t have access to proper study areas. 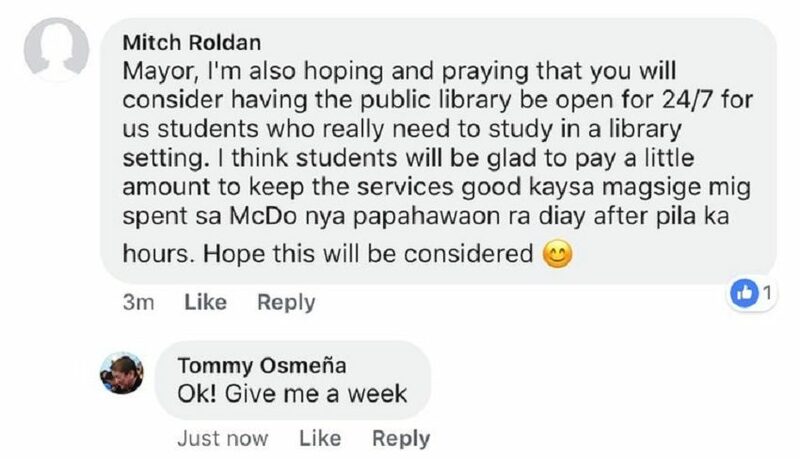 In response, Cebu City became the first in the country to open a 24 hour city library that has public wifi. The library will give priority to students looking for a space to study. The City Office also plans to update its privacy laws to prevent people from accessing illegal content on public wifi. Despite being the second largest city in the Philippines, Cebu didn’t have an organised public transport network until recently, Villarette says. The city is now building a new bus rapid transit (BRT) that will deliver citizens a low cost mode of transport while reducing the burden on roads and traffic. Cebu is the first city in the Philippines to setup a BRT system, and looked overseas to learn from others’ experience. While planning the project, the Mayor visited Curitiba city, Brazil which implemented the world’s first bus rapid system, and Bogota, Colombia known for one of the world’s largest bus networks. The first part of the bus system will run between the north and south of the city and is being implemented. The City Office is now planning future bus networks which will connect Cebu City to other cities. We are having problems right now because of some political interventions but we are confident that it will be completed in two years time,” Villarete emphasises. An initiative that is enjoying great popularity is the ‘Sardines for Garbage’ campaign, he adds.The government hands out cans of sardines to residents who bring out their own trash to the garbage trucks during collection. “For the first time in my life, we have seen people stealing other people’s garbage,” he notes. The programme is meant to discourage people from throwing garbage on the streets, and prevent drainage pipes from getting clogged and flooding the city. Cebu learnt of this approach also from Curitiba, trialled it in two wards and is now rolling it out across other parts of the city. Cebu has recently joined the new ASEAN Smart City Network. Villarete notes it is an opportunity to further leverage lessons from other cities that might have experienced the same problems. “It actually opens a platform for us to discuss with 25 other cities, and we can gain new knowledge and we can see new technology,” he points out. For instance, he wants to learn from Singapore how to better map the city. Cebu is looking far and wide for ideas to tackle its biggest challenges. But in the meantime, their Mayor is an SMS away.